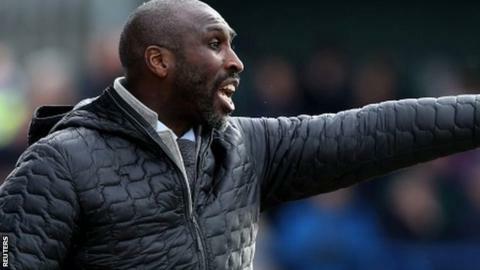 Lincoln City's charge towards promotion was stalled as they were held to a 1-1 draw with relegation-threatened Macclesfield. But the League Two leaders actually increased their advantage at the top to eight points as Bury, who began the day in second place, lost at home to Swindon. Danny Cowley's Imps were stunned when Sol Campbell's battling side took the lead on 28 minutes after Elliott Durrell found Scott Wilson, who impressively swept the ball home. But Bruno Andrade put the Macc defence on the back foot with a surging run forward before being tripped a couple of yards outside the box, Neal Eardley took the resulting free-kick and placed it perfectly into the top corner of the net to make it 1-1 on 38 minutes. The Imps pinned Town back in the early stages of the second half, Eardley almost scoring again when his cross-shot was beaten away by a flying O'Hara. But the Imps were frustrated by the visitors thereafter. Having offered virtually nothing as an attacking force in the second half, Macc almost reclaimed the lead with six minutes left when James Pearson unleashed a fierce dipping volley which was tipped over by Matt Gilks. But it was not enough to prevent Macc slipping to the bottom, as Notts County won at Stevenage. Match ends, Lincoln City 1, Macclesfield Town 1. Second Half ends, Lincoln City 1, Macclesfield Town 1. Substitution, Macclesfield Town. Brice Ntambwe replaces Ben Stephens. Attempt missed. Shay McCartan (Lincoln City) left footed shot from the centre of the box is close, but misses to the right. Corner, Macclesfield Town. Conceded by Matthew Gilks. Attempt saved. James Pearson (Macclesfield Town) right footed shot from the right side of the box is saved in the top centre of the goal. Nathan Cameron (Macclesfield Town) is shown the yellow card. Substitution, Macclesfield Town. Tyrone Marsh replaces Scott Wilson. Substitution, Lincoln City. Michael O'Connor replaces Mark O'Hara. Substitution, Lincoln City. Shay McCartan replaces Harry Anderson. Attempt saved. Cian Bolger (Lincoln City) header from the centre of the box is saved in the bottom right corner. Corner, Lincoln City. Conceded by Kieran O'Hara. Corner, Macclesfield Town. Conceded by Neal Eardley. Attempt blocked. Bruno Andrade (Lincoln City) right footed shot from a difficult angle and long range on the left is blocked. Corner, Lincoln City. Conceded by David Fitzpatrick. Attempt missed. Scott Wilson (Macclesfield Town) right footed shot from outside the box misses to the left. Corner, Lincoln City. Conceded by Nathan Cameron.